Like many Americans, I was transfixed to my television yesterday as news of the bombing at the Boston Marathon unfolded. The initial explosion was replayed countless times until I couldn't look anymore. I had thought that through constant watching, I would somehow numb myself to it, but instead only became more distraught each time the concussive blow went off. The one thing that caught my eye amid all of the chaos, and kept me watching, was the bunch of yellow balloons. 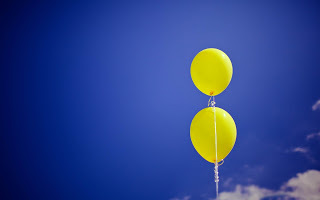 There is an initial jarring, and movement forward, then immediate release up to the sky as the holder of those balloons’ life changed forever. One can’t help but wonder if it was a child holding those strings tightly and possessively as children do of things full of wonderment and delight, only to have it ripped away. It’s a disturbing thought; and one I can’t seem to get out of my head. Life can change in a nanosecond, in the best but more often, worst of ways. It’s how we respond to these tragedies that make us who we are as a nation. And the responders were many. Another thought I had while watching the terror unfold was of people’s response to the event. You see some running away in fear, and some rushing in to help. I even asked myself the question: What would you do? Would you run away? Or would you run in to help? I’d like to think if I didn't have my son with me, I would run in to help, but I can’t know that for sure. Can anyone know what they would really do? Is there anything wrong with running in fear? Of course not. There was complete chaos and confusion. It’s human nature to want to protect yourself and your loved ones. That being said, it’s practically unnatural to run towards mayhem instead of away, but yet people did it. The sight of volunteers, police, National Guard, and even just bystanders ripping that fence away to get to the wounded was inspiring, and shows the true heart of our nation. This attack, from whoever it was, was not the first, and unfortunately most likely won’t be the last. We are all reminded of previous events that have tried, but failed, to shake our resolve. We are a free country. We have an open society. And the world is a dangerous place. It is a hard fact to live with, but somehow we do. We go on; a little thicker skinned, and a little more wary. Tragedy can strike anywhere, and anytime, but I am heartened in light of those yellow balloons lifting untethered to the heavens, that there are courageous souls willing to run in to help.